Summary AC1750 class access point with PoE and cluster management features. Linksys has been building up its small business product line over the past year or so. We've looked at its LGS552P Managed PoE+ switch and its LRT214 and LRT224 VPN Routers. 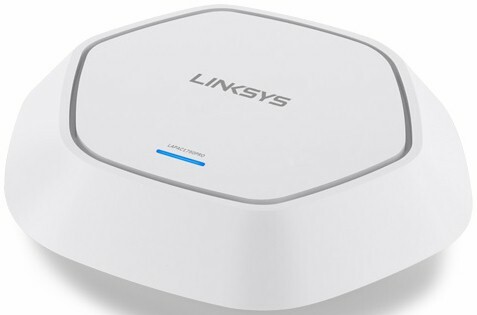 Although Linksys has also been shipping an assortment of N and AC access points for awhile, we're jumping right to the top of the line with this look at its LAPAC1750PRO. The LAPAC1750PRO is an business-grade access point with a broad feature set. It is primarily managed through a browser interface via HTTPS / HTTP, but can also be managed via SNMP. CLI (command line interface) jockeys, however, will be disappointed that there is no telnet or SSH option. Instead, there is a Cluster Management System that provides a single management interface to control an unspecified number of APs. The LAPAC1750PRO is meant to be installed on a wall or ceiling and includes a mounting bracket and also a backer plate to use when mounting on ceiling tiles. Even though the AP would normally be powered via 802.3at PoE, Linksys thoughtfully also includes a 12VDC power wart. The callout diagram below decodes the states and colors of the single tri-colored indicator. Note in the back panel description that the dual Gigabit Ethernet ports can be aggregated for higher bandwidth. I was unable to find controls to set up aggregation, so checked with Linksys. They said the two ports come configured for static LAG (not 802.3ad LACP). Note this means the ports aren't switched, so the second port can't be used to connect to other devices or APs. Linksys requested short-term confidentiality for the inside photos, so I had to open up the review sample after testing. The inside of the AP is very tidy, with generous use of RF shields. I noticed during testing that higher throughput was produced with the front of the AP aimed at the chamber antennas. Now that I see the antenna placement, mystery is solved. The key components are summarized in Table 1 along with the first AC1750 AP we got our hands on over a year ago, Ubiquiti's UAP-AC.